Priced per kit. Kit includes 2 slots (slot A + slot B). When your AES slots have worn out or have become increasingly unreliable, this is the best solution to make your system function like new again. Each home cartridge system requires 2 slots and there are no differences between slot A and slot B. 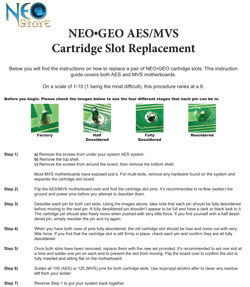 This kit includes a pair of new slots (total of two individual slots) for the Neo-Geo AES system, along with printed instructions in full color. These are 3rd party and not SNK made. For those who are uncomfortable doing this system upgrade themselves, the NeoStore recommends Xian Xi or Jeff Kurtz of the Neo-Geo.com forums for providing this service (should they be willing to accept the project, expect to pay them a nominal fee).